With our global e-commerce expertise, you can rely on Asendia to provide you with the best cross-border solutions to help you grow your business internationally. Discover how to take your company to the next level with our in-depth guides and industry insights, helping you enhance your cross-border delivery strategy and expand your customer base. One of the key decisions you will need to make if you’re looking to expand your business globally is how to choose the right delivery partner. Studies have shown that, when it comes to choosing one retailer over another, most shoppers will be loyal to a company based on the quality of the delivery experience. It's important to select the ideal cross-border delivery provider with proven expertise in parcel tracking, returns and keeping costs low. Learn how to optimise your business for global e-commerce with this exclusive guide. Get some helpful tips for newcomers to the growing international e-commerce market. If you want to expand globally, a great delivery provider will be key to your success. In this Guide you'll learn how to optimise your business for the growing international e-commerce market. 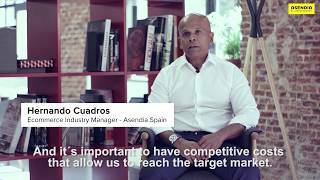 In this informative video, Hernando Cuadros, Asendia Spain’s E-commerce Industry Manager, offers key advice for fashion e-tailers. Find out what his expert view is on logistics, parcel traceability, market adaptation and more. Are you thinking of expanding into the global e-commerce market? The world of e-commerce changes rapidly and it’s important for online retailers to keep on top of current trends for continued growth. Attracting customers, keeping them informed, offering them options while incorporating new technology are all vital in achieving online success. For example, did you know that direct mail is a growing tool for reaching new customers around the world? Or that 92% of consumers prefer to browse websites in their own language? With our in-depth advice, Asendia can help you enter the international e-commerce arena. With billions of parcels containing online goods shipped across Europe every year, the e-commerce industry is continuing to flourish, along with online businesses around the world. For e-tailers, the extreme competition associated with a booming industry can be intimidating, let alone satisfying international customers with the right parcels solutions. For example, 76% of e-shoppers in Europe prefer the convenience of home delivery, while 91% demand clear delivery information. How do you please everybody? See below the key things to focus on. How Can You Reduce the Costs of International Delivery?